The beach is open at Mount Baldy, however the dune at Mount Baldy remains closed for public safety and dune protection. Access to the beach is from the Mount Baldy parking lot via a designated trail directly west of the dune. The trail is about 1/2 mile long and somewhat strenuous. The trail travels through an oak woodland and a newly marked trail will guide visitors from the wooded trail down to the beach. Please use only the marked route for your safety and resource protection and pay attention to all park signs. This is a very popular beach area and the parking lot is expected to fill quickly. Visitors are advised to arrive early on weekends and holidays to get a parking spot. The beach is open from 6:00 am to 11:00 pm. With high lake levels, the beach area may be limited. There are no lifeguards at this beach so swimmers must understand the dangers of Lake Michigan before entering the water. Swimming is strongly discouraged when there is rough water or large waves due to the danger of potential rip currents. Even with calm water, non-swimmers and children should always be very closely monitored by an adult. There are no trash cans provided, so beach goers are asked to pack out their trash. While visitors can no longer climb the Mount Baldy dune, weekly ranger-guided hikes are offered to the top of the dune. 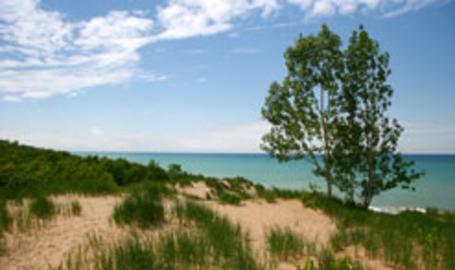 Visit our Indiana Dunes events page for dates and times of any upcoming hikes.